Matu held a banding session this morning at the Prince of Wales Park and had reasonable success. Not a big number of birds but a steady flow which was good as we used it to also train and refresh Ruby, Bernard and Ben who work at Zealandia, in banding and handling birds. In all we caught 50 birds of 9 species, only 1 was a recapture but this is the first recap at this new site. Chaffinch - 1 (1) the recap was banded about 5 weeks ago at our last session there. Kingfisher - 1 This is the first Kingfisher we have caught in this banding year which finishes tomorrow so only just makes it into the stats for the year. The first and only Kingfisher for the year. I am doing Jury service this week but this morning's court case was cancelled so I was given the afternoon off. So instead of sitting in a court room I spent a couple of hours at the Houghton Bay stream. There was a steady flow of birds into the nets and I ended up with a tally of 40 of 8 species with 36 new and 4 recaptures. I was also released from Jury service early yesterday so set the trap down the road at Bridie's for an hour or so in the afternoon. 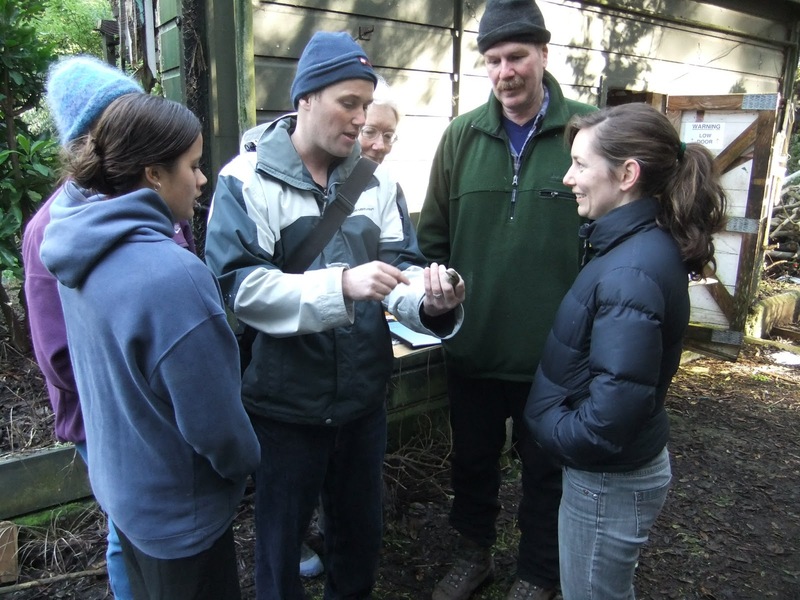 Caught 12 birds, all House Sparrows with 7 new and 5 recaps, the oldest recap was also banded in March 2011. One bird had a very long top mandible but must be managing all right as it has almost finished its moult and had an above average weight of 32.5g. 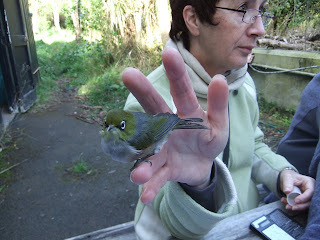 Ros and I had a busy morning at Island Bay catching 95 birds of 8 species with 88 new and 7 recaptures. The highlight of the morning was a single bird of a new species for the site, a juvenile Redpoll. We have been banding there since Feb 2007 and as far as I know this is the first Redpoll seen there let alone caught. Blackbird - 1 (3) the new bird had a wing length of 140 mm which is the longest we have recorded with the previous being 137 mm. The bird has finished its primary moult so was aged as a 2+. Redpoll - 1 (0) Redpolls are regular Winter visitors to Wellington City, feeding on annual, winter seeding grasses on playing fields but are rarely seen over Summer and Autumn We haven't caught one at the Zoo in the 12 years we have been banding there. The Redpoll about to go on its way. House Sparrow - 77 (4) still a huge number of Sparrows at this site with some recently fledged. Two of the recaps were banded recently and the other two last year. The last couple of mornings I have attempted to catch some of the Silvereyes that feed first thing in the morning at the fennel patch on Mt Albert. On Thursday morning I caught 20 new and 1 recapture, this morning 11 new and 2 recaps. All the recaps were recently banded. All birds were Silvereye with no bycatch. One bird was moulting atypically, still growing P3,8 & 9 with the others full length. A wet day has given me a chance to finally crunch the numbers for the Zoo banding for last calendar year so here is a bit of a summary. The totals include, as well as the regular sessions, a number of sessions at the little stream over the fence and also some nestlings. In all we banded 649 birds of 12 species and recaptured 266 of 11 species. This is slightly up on the average catch of 586 new birds over the 13 years we have been banding at the Zoo. A highlight of the year was a very successful workshop held on aging and sexing when Mike Bell come over from Blenheim and gave us the benefit of his knowledge. 1 Silvereye – 239 (173) Has been No 1 in all but 1 year and slightly up on the average. 2 Greenfinch – 99 (33) Has been No 2 for the last 3 years before that was usually No 3 and numbers fluctuate a lot between years. 4 Chaffinch – 69 (9) Well above average for new birds with numbers boosted by a large catch of juveniles at the stream site back in January. 5 Goldfinch – 37 (1) Moved up from 11th last year and well above the 13 year average. Another species boosted by juveniles being caught at the stream in January and also December. 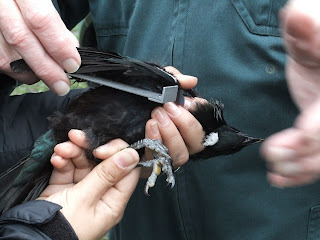 7 Tui – 25 (2) numbers boosted with a number of birds banded while in rehab at the Nest but the numbers generally follow the trend of increasing Tui over the last few years. 8 Fantail – 18 (2) About average numbers and another species caught regularly at the stream. 9 Dunnock 17 (8) After a fall in numbers last year has rebounded to be above average in 2012. 10 Starling – 11 (2) About an average number for the last 5 years but well below the 13 year average. We caught a lot more Starling in the first few years of banding and the drop is probably due to changes around the Zoo and net sites. Yellowhammer – none were caught. This species fluctuates a lot between years and numbers have dropped since the Zebras went and the hay containing grass seed stopped being fed. Kingfisher – also a zero tally, we haven’t caught one at the Zoo now for 2 years. Received a recovery report yesterday from the DOC Banding Office of a dead bird that had been reported to the DOC Information Center, unfortunately the person who took the call only took the band number and no other information. So we know it was a Starling banded at the Zoo back in Sept 2004 and at an estimated 3107 days is our oldest recaptured or recovered Starling. Pity we don't know a bit more about it. A grey day, not because of the cloud cover as it was actually quite sunny, but for the number of Grey Warblers about. This species seems to do very well in the Houghton Bay/Valley area, perhaps because of the lack of Shinning Cuckoos. In 5 years of banding there I have not seen or heard a S Cuckoo even though they are in the adjacent valleys. This morning I caught 26 birds of 7 species which although a reasonable catch it is not as many as there would have been a couple of years ago. I suspect that some have become wary of mist nets but this morning I saw another possible cause with a Stoat spotted near one of the nets. Silvereye - 8 (0) a small tally for this site and almost all caught in 1 net on the same net round. Fantail - 2 (3) all the recaps were banded in the last few months and have moulted into adult plumage. Grey Warbler - 6 (1) one of the highest catches of this little bird. The juvenile Grey Warblers had a variety of red in their eyes. Gradually changing into the adult bright red. I have had a couple of sessions at the stream near the Zoo with only limited success. Last Tuesday 5 March a 2 hour session late afternoon produced 9 birds of 4 species; all new birds. This morning I spent another couple of hours at the same stream and caught 12 birds also of 4 species and once again all were new birds. Blackbird - 1 this was one of the largest Blackbirds we have caught - a male which weighed 114 g and had a wing length of 135 mm. It had finished its primary wing moult so could only be aged as a 2+. Some of the juvenile Goldfinch are starting to show colour on their heads while others still look like newly fledged little brown jobs. This afternoon I went down the road to Bridie's and operated the trap in her garden for a couple of hours targeting the House Sparrows she is feeding. Caught 20 new and recaptured 4. I went up to the fennel patch patch on Mt Albert this morning in an attempt to catch Silvereyes that feed there just after dawn. Managed to catch 14 of them with 12 new and 2 recaptures. 1 of the recaps was from the session 10 days ago and the other was banded at the Houghton Bay stream 3 days ago which adds a bit more evidence to the idea that the Silvereyes using the Houghton Bay stream come from a large area. Several of the juveniles had dark bands across the end of their tails. Not sure if its a growth bar or perhaps a change of diet while the tail was growing. The only by-catch were 2 juvenile Dunnock. I had a couple of hours free this morning so set up a couple of nets at the Houghton Bay stream. It proved to be quite successful catch 47 birds of 8 species with 43 new and 4 recaps. Starling - 1 (0) This is our first Staling at this site for a couple of years. In 2008 our first year banding there we caught 19. At that time there was a stretch of open stream but since then it has become overgrown and very few Starlings now use it. Grey Warbler - 1 (1) the recap was banded in Feb 2010 so another reasonably old bird. Although not aged when banded it was noted that it had a brown eye, now it is bright red. Fantail - 3 (0) 2 juveniles and an adult all doing body moult but not moulting their primaries yet. We had a reasonably good banding session on Saturday morning but not so good in the afternoon. In the morning it was near perfect conditions little wind and mostly cloudy overhead. The cloud disappeared early afternoon and it became very hot and the birds also disappeared so we knocked off earlier than usual. A smaller turn out of banders turned up but just a nice number for the flow of birds. Mary our chief scribe entering data for Ros and Annette. In all we caught 50 birds of only five species with, as expected, juvenile Sparrows making up the majority. Silvereye - 2 (4) All the recaps were banded in the previous 2 years. Unusual to get more recaps than new birds at this time of year; perhaps Silvereye have had a poor breeding year although it was a very small sample. Grey Warbler - 0 (1) a bird banded back in Feb 11 so a reasonable age for this apparently short lived bird. House Sparrow - 32 (3) the oldest recap was banded at Bridie's on Hornsey Rd in Dec 2010 as a newly fledged unsexed juvenile so we now know it has grown into a handsome male, or he will be again when he finishes his moult. The wings of two juvenile Sparrows of similar age, female on left, male on right.